We left Foggia grateful that we only had 48 miles ahead of us. Our overindulgence on sun the day prior had us both in pain from extensive sunburns and we worried how our burned bums would fair in the saddle. We would soon find out! The highway out of Foggia was uninspiring to say the least. Flat, shadeless, and already very hot despite an early start. Parched grass lined the roads and only added to our feeling of being overheated from our burns. 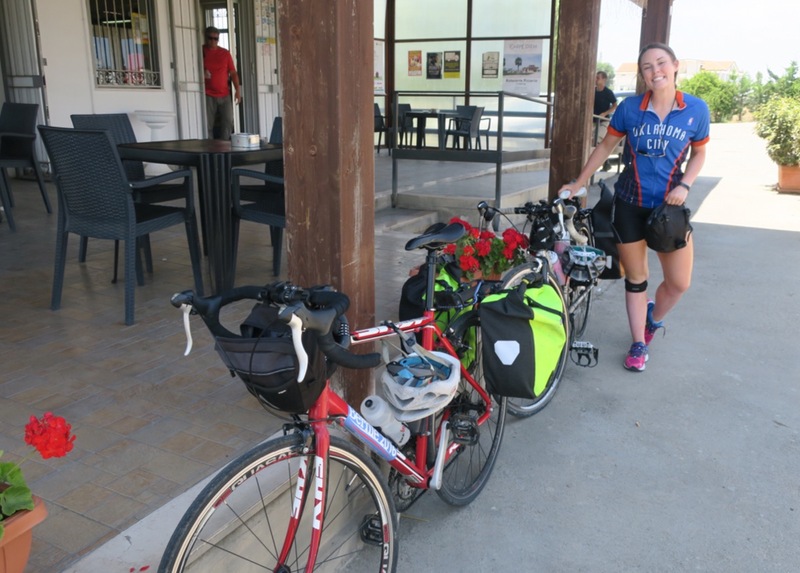 We sweated our way out of the city into sun beaten countryside and stopped at a gas station for a much needed sports drink. I don’t think we ever lingered at a non-lunch break so long. It was really difficult to pry ourselves from our shady haven. We continued on and I watched the sweat drip onto my sunglasses, blurring my vision and stinging my eyes. It was one of the hottest days so far, made only hotter by the fact that our sunburns were causing us to generate even more heat. At one point we stopped, exhausted, on the side of the road and sat on the guardrail in the only patch of shade for miles. Once stopped I felt like my body was radiating heat. This was the first moment of the trip I actually grew concerned about heat stroke. We sat in the shade until our heart rates calmed and our sweat cooled. 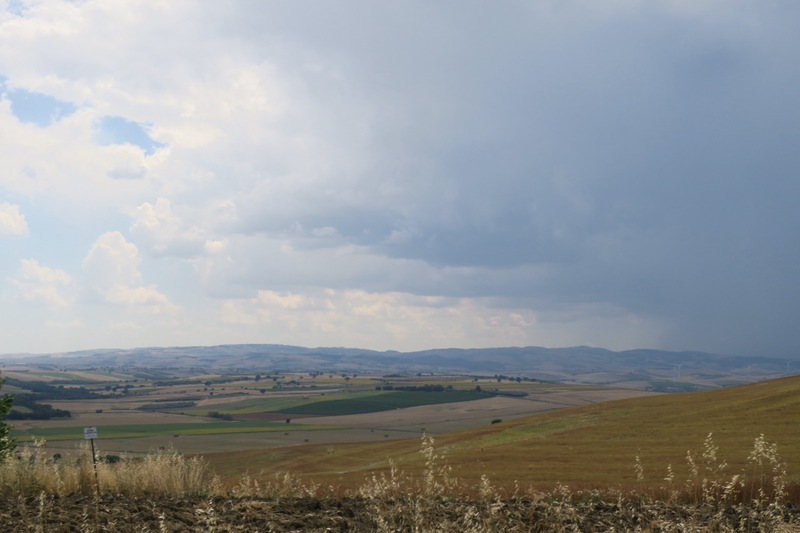 We rerouted around a hilltop town in hopes of avoiding some inclines and soon found ourselves amid gorgeous, rolling farmland. Then, drawing closer we saw thunderheads and storm clouds. They were bringing with them both shade and rain. Normally I detest riding in rain, but in this heat it would be appreciated. 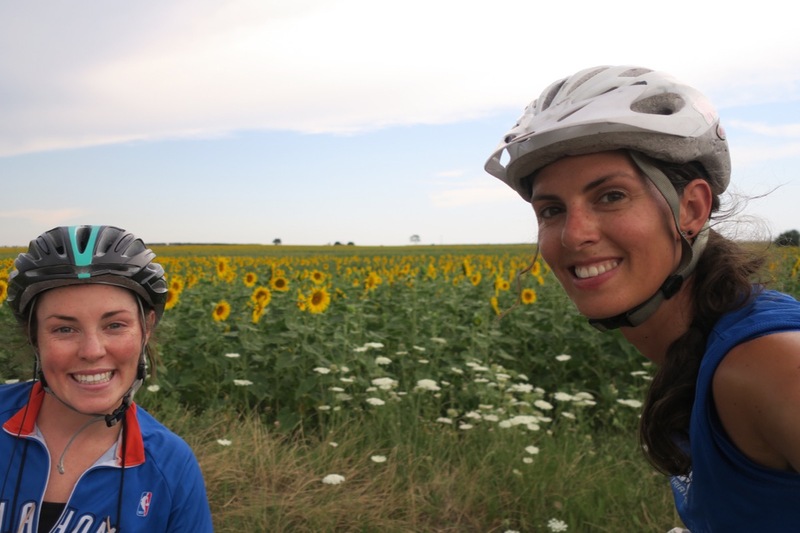 We cycled on under the welcomed cloud cover through farmlands and felt our spirits rise when the sunflowers appeared. Big, vibrant, saffron faces that seemed to cheer us on and nod in approval amid the breeze. 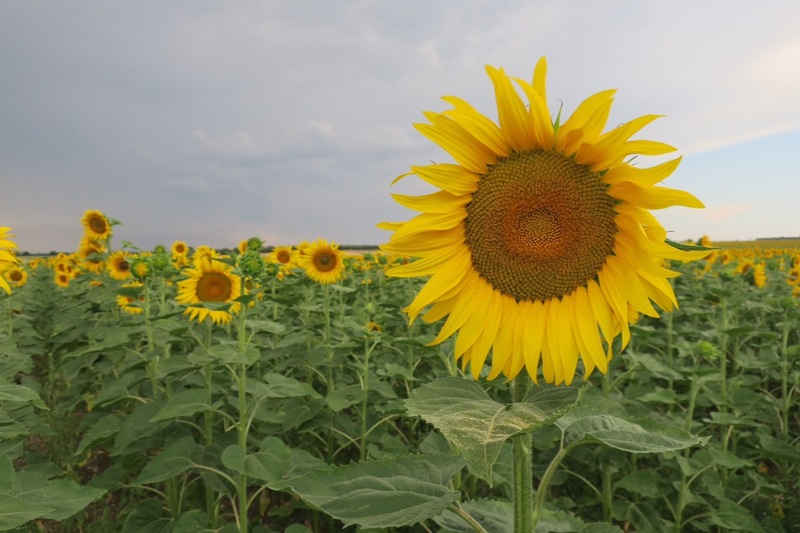 Did the sunflowers save us from an even longer, slower day? Maybe, maybe not. But they definitely gave us an extra jolt of energy we needed to keep going when our legs felt heavy and our energy drained.